ANAHEIM, February 7, 2017 – Precision grinding machine manufacturer, Glebar Company, celebrates it’s 65-year anniversary this year, by kicking off at MD&M West (booth 2911), with a continued focus on automation enhancements, in particular, targeting the medical device manufacturing market. Since its inception in 1952, Glebar has been renowned for innovations in centerless grinding and gauging, keeping lockstep with increasing demand for more precision manufactured components for virtually every industry – including medical. Addressing the demand to increase productivity while reducing costs, the company continues to reinvent its product offerings, designing and developing “lights-out” systems which are capable of more than just grinding. From pre-inspection to final inspection and packaging, the systems can be fitted with robots, setup reduction metrology and cleaning and drying stations providing a truly hands-off, turnkey solution for both high-production and low batch run grinding applications. Glebar’s goal is to make it easy for customers to fulfill their precision grinding requirements, with minimal operator intervention. Glebar’s GT-610 CNC centerless grinding system, first introduced in 2010, was designed for metal working applications, including grinding components for the medical industry. Since 2010, the GT-610 CNC has evolved in many ways. In 2015, Glebar innovated the process of centerless grinding and gauging of arthroscopic shavers used for orthopedic surgery on its GT-610 CNC. 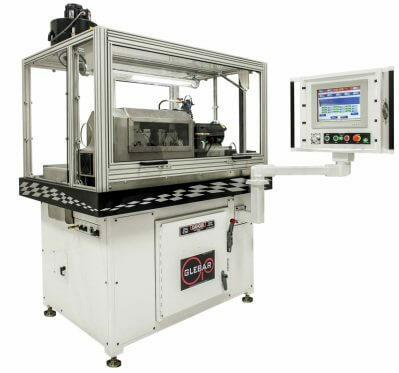 When challenged by a major medical device manufacturer to provide a solution that would reduce setup time and scrap and automatically grind an arthroscopic shaver component in one operation, in lieu of utilizing a number of machines performing a number of processes, Glebar responded by combining the GT-610 CNC with its P4K metrology system. 1. Glebar’s GT-610 CNC movable work rest blade (while grinding). Glebar engineers leveraged its innovations in grinding titanium aerospace fasteners and applied those to develop additional capabilities for grinding arthroscopic shavers on the GT-610-CNC. Glebar’s GT-610 CNC’s movable work rest blade and CNC dressing system work in tandem to allow for grinding an arthroscopic shaver in one operation. 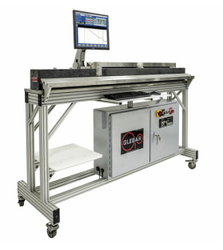 Glebar’s GT-610 CNC also offers repeatability through its built-in CNC dresser which automates the dressing and setup process, minimizing down time between dressing cycles. Built-in software wizards configured for a part family, further reduce setup and programming times. The movable work rest blade also insures positioning of the workpiece to achieve +/-0.0002 tip and body dimensions with a superior surface finish, while eliminating any marking on the component when backing out the wheel at the end of the grind process. Incorporation of the system drastically reduced setup time and improved the quality of the component. The P4K Gauging System is the market’s fastest and most accurate profile metrology system available for parts manufacturing. The system’s high-speed, high-accuracy optical micrometer technology scans geometric profiles for all parts in a cycle to automatically correct wheel dress shape (correcting the wheel dress shape from P4K measurement results is patent-pending). This is done at up to three inches per second (75mm/sec) to produce a comprehensive dataset to line operators with diameter and length readings every 30 millionths of an inch, in real time. 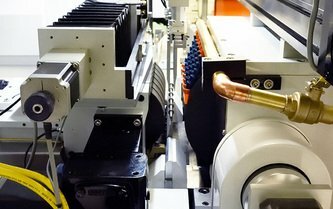 The CAM.2 micro-grinding machine is capable of manufacturing complex medical guidewires, dental parts, and small precision parts for various industries. Combining the latest in multi-axis servo motor control, submicron positioning, and an easy-to-use 15" touchscreen interface, the CAM.2 offers unmatched performance. Starting in 2001 with the introduction of the CAM.2's predecessor, the CAM-SXE, Glebar has revolutionized the medical guide wire industry by offering complete control of all aspects of the wire. With a conventional centerless grinder, the part is pulled through the machine by the work and regulating wheels. To grind a profile, the part's position is detected by sensors, and the gap between the wheels is adjusted. The CAM.2 takes this philosophy and inverts it. Using a patented dual-carriage linear motor part feed system, rather than monitor and react, the position, speed, and rotation are under absolute control at all times. This allows the machine to control with a high degree of accuracy, not only the diameter, but also the length. The CAM.2 represents one of the most advanced technologies in guidewire grinding, capable of holding the tightest tolerances in the industry. TF-9DHD Centerless Infeed/Thrufeed Machine - grinds both hard and soft materials from 1” and under in diameter. The TF-9DHD is utilized to grind guide wires, pins, bushings, Teflon, plastics, ceramics and other engineered materials. For more information about Glebar’s process optimization and automation capabilities for the medical industry, and/or if you wish to setup a booth interview, please contact Vito Barbiera, Communications Manager at 201-644-2046 or by email at vbarbiera@glebar.com. Full case studies and videos can be found on the company’s website. Founded in 1952, Glebar Company (www.glebar.com) is an innovative, vertically integrated manufacturing company that designs and configures its standard platform of modular machine systems – from an affordable job shop machine to fully automated, lights-out grinding packages – to provide custom solutions focused on process improvement and margin enhancement, maximizing a customer's return on investment. Glebar serves companies in many markets, from medical and metals to automotive and aerospace. Its machines are all made in the U.S.A. to the highest quality standards and are backed by a 24/7 customer service operation, serving customers all over the globe. 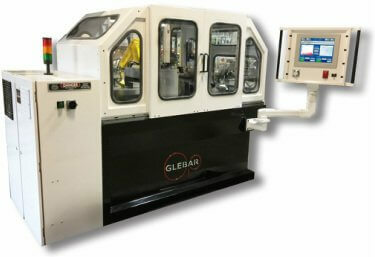 Glebar machines are known for their precision, longevity, flexibility and efficiency. Editor’s Note: High resolution images of the machine platforms and features mentioned in this release are available upon request. Two Glebar patent pending processes were put to work to deliver a comprehensive turnkey shaver solution to the customer.